Jake Bowers calls himself a modern Gypsy. After growing up on the road as one of 17 children, increasingly hostile public attitudes and the impending arrival of the first of his three children pushed him into a more settled life. 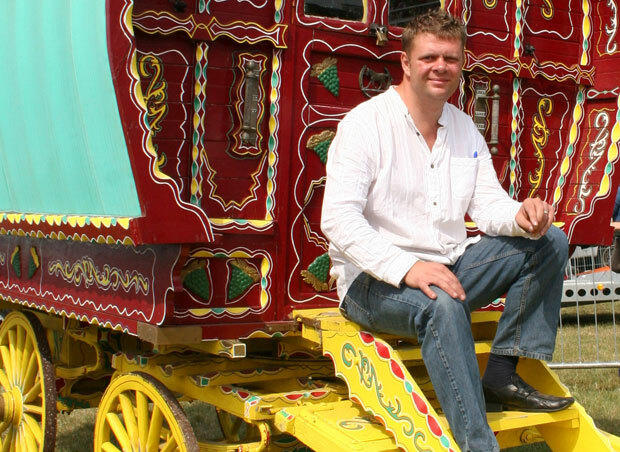 He now runs the Gypsy Media Company, providing education about Gypsies and travellers through media, and presents Rokker Radio, a BBC programme for the travelling community. Being a Gypsy is an ethnic identity in the same way as being Jewish or English. It’s something that you take with you no matter how or where you live. I’m a modern Gypsy in that I don’t make clothes pegs for a living any more – instead I sell words as a journalist. I’m a Gypsy in the information age. Under the Race Relations Act, Gypsy people are recognised as an ethnic minority, but in the 1968 Caravans Act it says that people of a nomadic habit of life, whatever their race or origin, are Gypsies. Here you see enshrined in law the entire problem of Gypsies being viewed as just a lifestyle. It’s something that is reinforced by the bizarre word “traveller”. Travelling just refers to a lifestyle, and it’s about as useful to describe most Romany people as travellers as it is to describe them as smokers or cyclists. It’s a stupid word that I reject. Although it doesn’t define us, the connection between Gypsies and travelling comes from a nomadic history that goes back well over 1,000 years, so it’s definitely part of our identity and culture. Most Gypsies in the world are now sedentary, particularly in eastern Europe, where some people haven’t travelled for generations. Probably half of the Gypsies in Britain haven’t travelled. My family goes back generations and generations into the mists of time in terms of travelling. Ironically, I’m probably the one in my family who travels most because of my job. I travel within the Romany community in the way that most journalists would travel, except that I often take a caravan with me. The community I work in lives that way, so there’s space for it. Life in a travelling family is based on extremely close-knit ties. I’m one of 17 brothers and sisters – I know my first, second, third, fourth and fifth cousins and they’re spread right across the country. I came from quite a stable family; we travelled in the summer and had places to stop in the winter. When we stopped I went to school and we were well integrated in the community. But when we travelled I didn’t go to school. In many ways prejudice was all around us, but we didn’t experience it directly. People get bricks thrown through their window, and suffer intense bullying at school, but it isn’t a uniform experience. Most of my family is now either living on gypsy sites where the nomadic way of life is outlawed or they’ve been forced into housing, so I’ve managed to retain an element of the culture that is denied other members of my family. I was travelling until I was about 25. I lived in an old wagon down in Dorset and was getting loads of abuse. I didn’t have anywhere to stop, and often people would refuse to give me water. I had a horse and wagon, but even when I was living a picture postcard life people didn’t want me near them. My wife got pregnant with my first child and we decided that we didn’t want to live like rejects any more, because that’s the way society viewed us. It struck me that he couldn’t have had any direct experience of Gypsy people. His perceptions were built up through a hostile media. I thought that if I was going to settle down, I might as well use the security that came with it to do something about these perceptions, so that those who were still travelling could live in a kinder environment. My radio show is broadcast across the east of England; it helps the travelling community to keep in touch with each other, since Gypsies are now more settled than ever before. I hope it also helps to educate the wider community about who we are, because a lot of media coverage is still hostile. When you look at the tabloids and local newspaper coverage you can see every rule of journalism being broken: they never speak to the Gypsies or travellers themselves, and the tone is usually inflammatory. I’ve just set up a website called savvychavvy.com, which is an engine for generating new writing by Gypsy journalists. We have funding to train 50 young journalists from the Department for Culture, Media and Sport. I travel all over the country working with organisations that are dedicated to improving understanding of the Gypsy and traveller community. I’ve just returned from Wales, where the Croeso (meaning “welcome” in Welsh) project, which is part of the Equality and Human Rights Commission, is campaigning for the Gypsy and traveller community to be accepted in Wales – some 500 years after we first arrived there. It’s a complex issue: the settled community looks at us through a prism of stereotypes. The two main Gypsy stereotypes are the thief (or degenerate) who contributes nothing, or the romantic Gypsy, unmaterialistic and carefree, who wanders down country lanes with a tambourine. The only real hallmark of a nomadic culture is that it teaches you to stand on your own two feet. Hard times are definitely going to come, but so are good times. When things no longer suit you, move on. Our flexibility and self-reliance means that we have little to fear from a changing world and economy. Many people only recognise Gypsies by their caravans – or traditionally horses and caravans. Before that it was tents. We’ve always changed the way we live and that will continue to happen. The fact that it’s largely outlawed in this country and in eastern Europe means you don’t see caravans on the road like you used to. But you can still see Gypsy people. If you go to Romania, where there are 2 million Gypsies, you can see them on every street corner. They have lived in the Gypsy quarters of most towns and cities for up to 600 years, and no longer have any folk memory of travelling. Because when the travelling ceases, the community still goes on.